Carl Snyder, a prison inmate and member of the Bard Prison Initiative Debate team, speaks during a debate against Harvard College Debating Union. (by Leslie Brody, The Wall Street Journal) NAPANOCH, N.Y.—On one side of the stage at a maximum-security prison here sat three men incarcerated for violent crimes. On the other were three undergraduates from Harvard College. After an hour of fast-moving debate Friday, the judges rendered their verdict. The audience burst into applause. That included about 75 of the prisoners’ fellow students at the Bard Prison Initiative, which offers a rigorous college experience to men at Eastern New York Correctional Facility, in the Catskills. 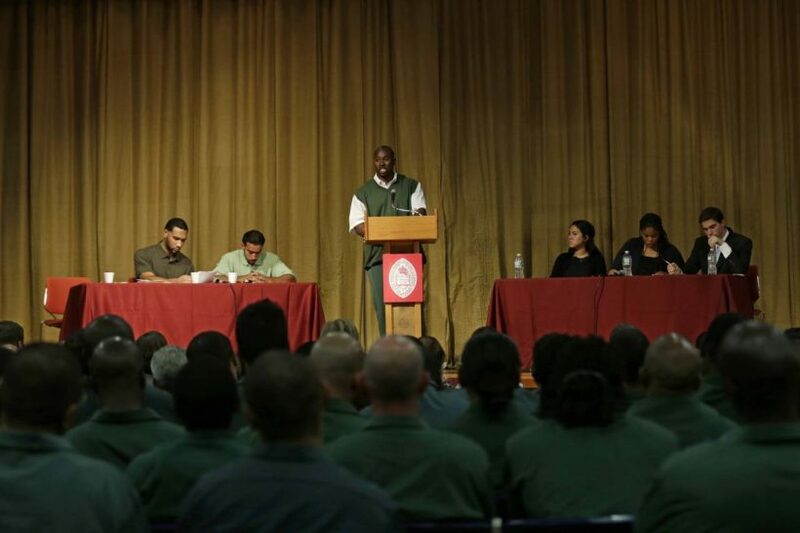 The debaters on both sides aimed to highlight the academic power of a program, part of Bard College in Annandale-on-Hudson, N.Y., that seeks to give a second chance to inmates hoping to build a better life. Judge Mary Nugent, leading a veteran panel, said the Bard team made a strong case that the schools attended by many undocumented children were failing so badly that students were simply being warehoused. The team proposed that if “dropout factories” with overcrowded classrooms and insufficient funding could deny these children admission, then nonprofits and wealthier schools would step in and teach them better. Ms. Nugent said the Harvard College Debating Union didn’t respond to parts of that argument, though both sides did an excellent job. The Harvard team members said they were impressed by the prisoners’ preparation and unexpected line of argument. “They caught us off guard,” said Anais Carell, a 20-year-old junior from Chicago. The prison team had its first debate in spring 2014, beating the U.S. Military Academy at West Point, N.Y. Then, it won against a nationally ranked team from the University of Vermont and in April lost a rematch against West Point. Preparing has its challenges. Inmates can’t use the Internet for research. The prison administration must approve requests for books and articles, which can take weeks. In the morning before the debate, team members talked of nerves and their hope that competing against Harvard—even if they lost—would inspire other inmates to pursue educations. Ms. Nugent said it might seem tempting to favor the prisoners’ team, but the three judges have to justify their votes to each other based on specific rules and standards. The Bard Prison Initiative, begun in 2001, aims to give liberal-arts educations to talented, motivated inmates. Program officials say about 10 inmates apply for every spot, through written essays and interviews. There is no tuition. The initiative’s roughly $2.5 million annual budget comes from private donors and includes money it spends helping other programs follow its model in nine other states. Last year Gov. Andrew Cuomo, a Democrat, proposed state grants for college classes for inmates, saying that helping them become productive taxpayers would save money long-term. He dropped the plan after attacks from Republican politicians who argued that many law-abiding families struggled to afford college and shouldn’t have to pay for convicted criminals to get degrees. The Bard program’s leaders say that of more than 300 alumni who earned degrees while in custody, less than 2% returned to prison within three years, the standard time frame for measuring recidivism. In New York state as a whole, by contrast, about 40% of ex-offenders end up back in prison, mostly because of parole violations, according to the New York Department of Corrections and Community Supervision. Published September 18, 2015 at The Wall Street Journal. Reprinted here Oct. 8, 2015 for educational purposes only. Visit the website at wsj .com. 2. Tone is the attitude a writer takes towards his subject: the tone can be serious, humorous, sarcastic, ironic, inspiring, solemn, objective, cynical, optimistic, encouraging, critical, enthusiastic… Which word do you think best describes the tone of Leslie Brody’s commentary? Explain your answer. 3. a) What do you think about the opportunity these inmates have been given?